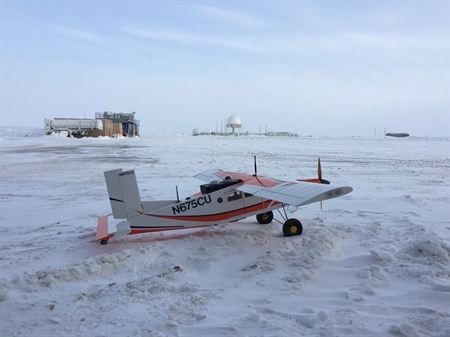 New NOAA research is showing how drones and other unmanned technologies can cost-effectively collect weather data in severe or remote environments and contribute to the improvement of weather and climate predictions. 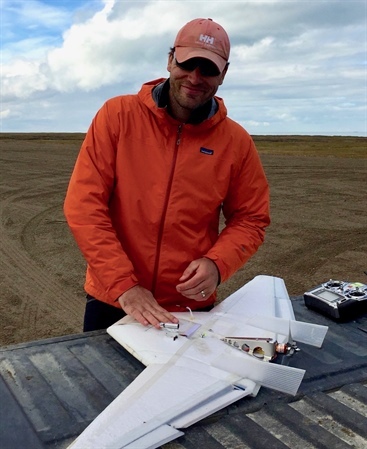 In a series of field campaigns supported by the U.S. Department of Energy at Oliktok Point, Alaska, a team of researchers led by Gijs de Boer, a CIRES scientist working at NOAA, have demonstrated the ability of unmanned aircraft systems, such as drones and tethered weather balloons, to operate in a harsh Arctic environment. These small, easily deployable platforms are proving that they’re capable of capturing data over tundra, ice and water which are important to improving the accuracy of models but unobtainable by other means. CIRES/NOAA scientist Gijs de Boer preparing a DataHawk 2 for launch during the ERASMUS field campaign in 2015. Photo credit: William Finamore, U. Oklahoma. Results of the research were published in the June edition of the Bulletin of the American Meteorological Society. Scientists are intensely interested in understanding the Arctic’s rapid transformation because commercial activities such as energy exploration and marine transport require accurate weather forecasting. However, Arctic weather and climate models are struggling to simulate these changes, such as the disruption in the formation and evolution of sea ice - critical information for both commerce and sustenance fishing and hunting by residents. To improve the skill of these models, scientists need additional data, which due to the Arctic’s extreme weather and remote location, may have been difficult or impossible to collect in the past. Since 1997, the Department of Energy’s (DOE) Atmospheric Radiation Measurement (ARM) program has collected measurements at a DOE research station next to NOAA’s Barrow Atmospheric Baseline Observatory near Utqiaġvik (formerly Barrow) at Atquasuk (approximately 60 miles inland from Utqiaġvik) and, more recently, at Oliktok Point, 165 miles east near Prudhoe Bay. These ground-based measurements have helped scientists better understand the Arctic system, but their observational range is limited. To learn more about lower-atmosphere processes, scientists are turning to small, cheap, easily deployable unmanned systems such as tethered balloons and unmanned aircraft system (UAS) platforms, or drones. Balloons can be deployed from remote locations and offer extended flight times in good weather. Drones offer greater vertical and horizontal range, and can acquire data beyond the line of sight of the operator. “With balloons and unmanned aircraft, we can cover larger areas and capture measurements across a model grid box instead of at a single point, and that’s important for model development,” de Boer said. Thanks to the team’s work at the Oliktok Point proving ground, DOE is now accepting proposals from atmospheric scientists to deploy UASs at their research sites. In addition to his Arctic research, de Boer is the organizer of this year’s annual gathering of an international community using UAS for atmospheric research known as ISARRA, short for the International Society for Atmospheric Research using Remotely piloted Aircraft. Following a week-long conference at the University of Colorado Boulder, over a hundred scientists, engineers and aircraft pilots will regroup for a week of science flights in southern Colorado’s San Luis Valley. Later this summer, de Boer will join his NOAA colleagues for two additional field campaigns at Oliktok Point, one in support of the Year of Polar Prediction, the second in support of Stratified Ocean Dynamics in the Arctic, or SODA, an interagency effort led by the US Office of Naval Research. To learn more about NOAA’s work with instrumented, unmanned aircraft systems, visit: https://uas.noaa.gov/.